Ferroperm-EMC manufactures NiZn-ferrites with permeabilities from 7 to 1500 and with high Q-values. Our main products are Balun- and Ring-cores. But many customers specifies special forms, materials, or tolerences. Applications are mostly military applications, like Balun cores for antennas or Inductors with high Q-values. For material properties please click on the buttom on your right. Ferroperm-EMC manufactures Balun cores from 4 to 40mm measured over the outside diameter over the two holes. They are available in all materials from 7 to 1500 in permeability. Ferroperm-EMC manufactures Toroidal Cores from 2 to 60mm outside diameter. They are available in all materials from 7 to 1500 in permeability. 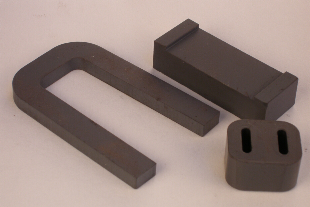 Ferroperm-EMC manufactures a wide range of Ferrite Cores made to Customers' specifications in many forms.